A delayed flight back from Belfast on Saturday night allowed plenty of time for reflection on the DUP conference. Things will be easier when Boris's bridge - an easy build, he reckoned - is constructed. At least it's more straightforward leaving Northern Ireland than Northern Ireland leaving the EU. The conference was the blowback of purist political unionism against pragmatic economic unionism (and soft Irish nationalism). The EU backstop must have felt pummelled by Saturday's close. It was to be binned, junked, ditched, ended, rejected, abhorred and eschewed. The Brexit messages from the DUP's gathering were unambiguous. No regulatory divergence between Great Britain and Northern Ireland; no backstop; no compromise. Team Dodds had delivered these messages in no uncertain terms even before the blond English one took to the stage to address his "fellow unionists". By the time he had finished Brexiting, the audience seemed so exhausted opposing the Prime Minister's deal that it was almost a relief to hear (briefly) about RHI from the DUP leader. Theresa May's withdrawal agreement had already been denounced repeatedly. The DUP leader merely reiterated her party's views of its flaws. In the medium-term - an undefined passage of time - the withdrawal agreement would lead to divergence and regulatory barriers, weakening Northern Ireland's place in the UK single market. Local business and farming leaders were suffering from false economic consciousness, cash blinding them to the supposed constitutional implications of EU-UK joint authority. That Brussels was finalising the withdrawal agreement even before the DUP conference had adjourned for lunch was of little importance. Westminster leader Nigel Dodds insisted it was somehow "not too late" for a better deal. This must not put Northern Ireland in an "EU straitjacket" in which its MPs and MLAs would be irrelevant. Johnson denounced the "humiliation" of having to ask the EU for permission to leave and claimed that Northern Ireland would be an EU "satellite state". For him, the solution was to withhold half of the transitional payment to the EU until it guaranteed freedom to leave. Despite the condemnation of the Government's EU withdrawal proposals, the desire to retain the 'confidence and supply' deal was apparent. Johnson needs it if he is to be the next Conservative Prime Minister. The DUP needs it because it has been useful on non-Brexit issues. Power granted is not easily resigned. The DUP leadership reiterated it was a Conservative-DUP arrangement, not a May-DUP deal, a thinly veiled warning to the Prime Minister that her political shelf life may be short. Johnson resisted licking his lips at the job opportunity created by a May downfall, studiously concentrating on Northern Ireland's status. But as he waxed lyrical about Ballymena buses it was evident the former Foreign Secretary would long to ride one into Downing Street to take over and somehow negotiate a "Super Canada" deal. He also warned of "electoral revenge" if there is a failure to deliver Brexit. He wasn't just addressing a DUP audience with that line. While Johnson had some good lines, he had - extraordinarily - been outgunned in the laughter stakes by Chancellor Philip Hammond during Friday's conference dinner. When Hammond finally started walking the Brexit tightrope, though, his hints at some possible side-concessions to the DUP failed to impress. The DUP scorns side deals to the real agreement. Remember Prime Minister Blair's letter to UUP leader David Trimble saying that as far as he (Blair) was concerned, decommissioning was part of the Good Friday Agreement? It wasn't worth the paper on which it was written. All that mattered was the actual deal. Likewise, a Hammond-DUP 'understanding' on aspects of Brexit is simply irrelevant. All that pertains is the official 585-page withdrawal agreement signed off by all the EU member states. The surprise of the conference was Arlene Foster's apology for the Renewable Heat Incentive scandal. This was smart. It hardly pre-empted what Sir Patrick Coghlin will say - despite some of the negative rantings on Twitter - and struck the right tone. Mrs Foster was adamant: "No excuses". And the DUP leader went further in reprimanding some (unnamed, but she didn't need to) elected representatives about their conduct. You felt the heat from some reddening cheeks in the front rows way back in the hall. Thank goodness Boris was there to lend some moral rectitude. Insistent that there was no binary choice between London influence and Belfast power, Mrs Foster pleaded for a return to Stormont. She insisted that a new cultural deal was needed, a clear effort to revive an Irish Language Act within a broader framework. No criticism of other parties, including Sinn Fein, was forthcoming. The need for an agreed Executive coalition plan was acknowledged. Alongside the mea culpa on RHI, this was distant from the Arlene of crocodiles infamy. While the DUP conference enjoyed unprecedented attention, all now rests on whether the Prime Minister can miraculously get the EU exit deal through the House of Commons. With the deal signed off, the pressure to back it may increase. Will Jeremy Corbyn's Labour Party remain opposed? Corbyn was denounced more by Johnson for his Irish republican sympathies than by the DUP on Saturday. 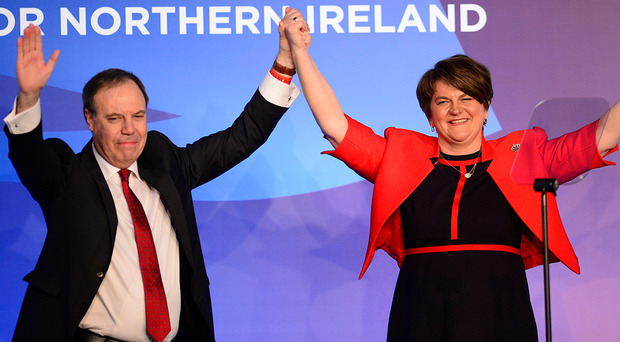 If Labour stands firm, perhaps Corbyn might address the DUP's 2019 conference, in recognition of his remarkable political journey from lifelong united Ireland advocate to opponent of any GB-NI divergence. The understandable orthodoxy is that no outcome is good for the DUP. There is an alternative perspective. If the deal holds and Northern Ireland prospers economically, the UK Union - reshaped - might hold. The DUP won't be held to account for opposing the EU withdrawal agreement any more than it was for rejecting the Good Friday Agreement. And if the withdrawal agreement fails to pass Parliament, the DUP can claim victory. The worry is what such a "victory" might bring.